Although not on purpose, people have a habit of taking for granted certain activities that they can do every day. You might not think a second thought about your amazing ability to transport yourself around, unless otherwise reminded. Having bunions on your feet, though, might just make you grateful for your pain-free walks, especially if you’re a teen. In some cases, you might even need professional treatment or surgery for the painful bunions. Do you instantly attribute this foot problem to women in high heels? The idea isn’t totally true, but you have good reason to think so. You take one look at the tight, pointy shoes that many women wear, and you can see a potential reason that they often experience more foot problems than men. Especially in teens, however, the condition goes beyond footwear. As many as 30 percent of adolescents deal with bunions, and a large portion of those suffering are girls. Since these girls haven’t worn high heels for decades, their shoes could not have started the problem. Essentially, bunions are bony bumps that form at the base of the big toe. 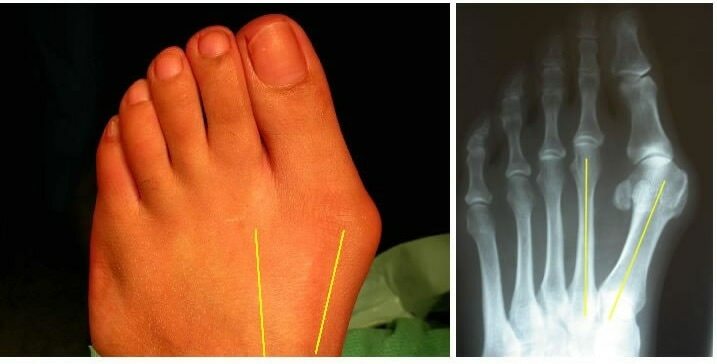 These bumps happen when the toe starts bending at an irregular angle into the second toe. While footwear can exacerbate the problem, it usually has a strong basis in heredity. If your mother had a problem with bunions, there’s a good chance that you will too. In addition to the bony bump, a sufferer might experience swelling, redness, and anywhere from mild to severe pain around the affected joint. You might have trouble walking or finding comfortable shoes to wear. If the bunions are limiting your activities and causing persistent or severe pain, consider going to the doctor. Treating bunions through medical intervention does not have to mean surgery. Actually, a good podiatrist will exhaust all other corrective methods outside of surgery first. Why would they go through that trouble? As a teen, your bones may still be growing, and the doctor would not want to unnecessarily risk damage to the bone’s growth plate. You should still seek professional advice and perform any measures to correct the problem before it gets any worse. Depending on the severity of your bunion, a podiatrist might opt for several different treatment routes. For mild cases, you might only need to wear wide shoes, use shoe inserts, and stay away from certain strenuous activities. For moderate bunions, the doctor may prescribe more customized foot orthotics, toe spacers or splints, or physical therapy. Even in severe cases, you should try these methods first before taking treatment any further. Many patients can heal their foot problems and return to normal activity through these gentle, non-invasive methods. If you have worked with a podiatrist using a variety of non-invasive treatments and are still suffering, you may need corrective surgery. Statistically, this surgery proves highly effective at solving the problem, according to a recent review published in the Journal of Children’s Orthopaedics. In fact, this research reviewed data on 9 different surgical studies with over 140 teenage patients. The studies followed the patients for over 3.5 years after the surgery and found that 86 percent were satisfied with the results. Recurrence of the bunions only happened in 8 percent of patients, although researchers maintain that this number might increase with age. While studies do need more data over longer periods of time, this review shows the effectiveness of the surgery within the first few years. Even still, doctors approach bunion surgery in children and teens cautiously, and they should. If your doctor has advised bunion surgery, you can expect a high level of success. After the surgery, you will need several weeks to recover, including a progression of activity that may require crutches or a special boot. Ideally, this surgery would take place between ages 14—17 when bone growth has slowed down. If you’re suffering with painful bunions on your feet, keep your chin up. You have a number of treatment options available, and many involve non-invasive corrective measures. While doctors should steer away from bunion surgery as much as possible, they may recommend it if no other methods are correcting the problem. Even then, the surgery has a high success rate and should get you back to your everyday teen activities in a matter of weeks.